Friday, April 19, 2019 | 11:36:18 PM A retail and wholesale nursery specializing in palms of all sizes climatically suited for California. California Palm Nursery is your Southern California Palm Source! We have a Huge Selection of common palms such as King Palms, Queen Palms & Pigmy Date Palms, etc., as well as hard to find Fish Tail Palms, King Kong Palms, Triangle Palms, Windmill Palms, Travellers Palms and other varieties. California Palm Nursery is dedicated to providing California acclimated Palms and Palm Trees such as King Palm - Archontophoenix cunninghamiana, Queen Palm - Syagrus romanzoffiana, Pigmy Date Palm - Phoenix robellini, Mountain Fishtail - Caryota urens, King Kong Thai Giant. Get started on renovating your Garden Give your home the look of your dream! California Palm Nursery is dedicated to providing California acclimated Palms and Palm Trees such as King Palm - Archontophoenix cunninghamiana, Queen Palm - Syagrus romanzoffiana, Pigmy Date Palm - Phoenix robellini, Mountain Fishtail - Caryota urens, King Kong Thai Giant - Caryota gigas, Giant Mountain Fishtail - Caryota obtusa, Silver Bismarck Palm - Bismarckia nobilis, Triangle Palm - Dypsis decaryi, Chinese Windmill Palm - Trachycarpus fortunei, Dwarf Chusan Palm - Trachycarpus wagnerius, Giant White Bird of Paradise - Strelitzia nicolai, Tropical/Orange Bird of Paradise - Strelitzia reginae, Travellers Palm - Ravenala madagascariensis, Painted Timber Bamboo - Bambusa vulgaris “Vittata”, Non-running clumping bamboo, European (Mediterranean) Fan Palm - Chamaerops humilis, Blue European (Mediterranean) Fan Palm - Chamaerops humilis Cerifera, Dragon Tree - Dracena draco, Sago Palm - Cycas revoluta in Orange County, Los Angeles County, San Diego County and throughout Sourthern California. 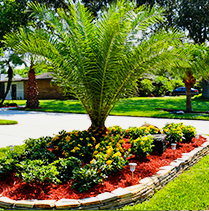 We provide palm trees to Santa Ana, CA - palm trees Orange County, CA - palm trees Irvine, CA.